Tom Palazzolo uses his camera to capture the stories of Chicago not shown in glossy postcards. Filmmaker Tom Palazzolo isn’t afraid to get dirty. Or drenched. Or sunburned. That much is clear when watching the DVD Tom Palazzolo’s Chicago, newly released by Chicago-based Facets Multi-Media. Tom Palazzolo’s Chicago is a collection of three of Palazzolo’s short films: Labor Day, East Chicago (1979); I Married a Munchkin (1994); and Down Clark Street (2000). Each short is roughly 30 minutes, for a total 92-minute run time. The collection is merely a sample of Palazzolo’s entire oeuvre, but it provides a thoughtfully curated omnibus of his creative output. Palazzolo grew up in St. Louis, Missouri, but moved to Chicago in 1960 to attend the School of the Art Insitute of Chicago (SAIC). He originally planned to study painting, but after he started photographing the subjects he intended to paint, he soon became more enamored of still and motion pictures. Inspired by such movements as direct cinema, cinema vérité and Chicago’s own underground film movement, Palazzolo cut his teeth making observational documentaries about subjects ranging from mundane social customs like wedding showers to major events like the 1968 Democratic National Convention in Chicago and the public unrest that accompanied it. The films in Tom Palazzolo’s Chicago land somewhere in the middle of that subject-matter continuum. The first, Labor Day, East Chicago, is a shining example of an observational documentary. Shot on a sun-baked September day in 1978, Palazzolo makes his way through the throngs enjoying a civic celebration in a working-class section of the city, capturing the goings-on as they unfold before him. The film bears some resemblance to Lindsay Anderson’s 1953 documentary O Dreamland, but in contrast to Anderson, advances in technology allowed Palazzolo to capture live audio while shooting, lending more realism and immediacy to Labor Day, East Chicago. Providing the narrative spine of Labor Day, East Chicago is a contest for “Miss East Side”, a competition hosted by the local Lions Club wherein a number of young women are asked a series of questions and then a mixed panel of judges selects a winner based on the merit of the answers. Palazzolo showcases this event in panorama, capturing the emotion of the competitors, the support of the girls’ families and friends, and the enthusiasm of the crowd. In true cinema vérité fashion, sometimes the camera goes unnoticed by the people Palazzolo is filming, while at other times they are seen mugging at or speaking directly into it -- with their hearty blue-collar Chicago accents naturally in full, glorious display. Also in evidence is Palazzolo’s sense of humor: when one of the contestants declares the greatest quality of friendship is loyalty, Palazzolo jump-cuts to a clip of a woman walking her dog. Similarly, when another girl says the best thing she’s learned from her parents is responsibility, Palazzolo cuts to a shot of a couple nearly copulating in the park in broad daylight. In an interesting counterpoint, Palazzolo chooses to intercut clips of the urbane Miss East Side competition with clips of the day’s boxing tournament. A sort of proto-Hoop Dreams, both contests portray the highs and lows of young people’s aspirations. 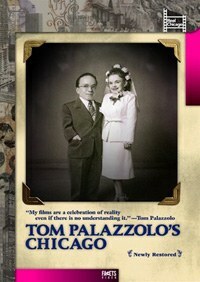 In I Married a Munchkin, Palazzolo switches to an interactive documentary style, interviewing Mary Ellen St. Aubin, a little person born in Chicago in 1920. Mary Ellen’s husband was Pernell St. Aubin, also a little person. Both of them were in show business in the '30s and '40s; one of Pernell’s credits was as a Munchkin soldier in The Wizard of Oz (1939), thus the film’s title. Palazzolo’s care and respect for his interviewee is evident, but the film’s greatest strength is the way Palazzolo presents its ethical dilemma. Running parallel to Mary Ellen’s personal narrative, Palazzolo inserts cutaways to: newsreel clips from the 1933 World’s Columbian Exposition in Chicago, where a “Midget Village” (sic) was one of the attractions (and where Pernell was one of its “inhabitants”); clips from The Wizard of Oz; clips from the 1946 film Three Wise Fools, in which Mary Ellen was cast as a leprechaun; and clips from the 1992 Wizard of Oz Festival in Chesterton, Ind. This approach allows Palazzolo to gently ask whether or not it is exploitative to cast little people in films or in parades just because they’re small. Palazzolo leaves the audience to draw their own conclusions based on the evidence he proffers. Finally, Down Clark Street is Palazzolo’s self-narrated retrospective, wherein he compares and contrasts stills and movies he took of Chicago’s Clark Street in the '60s with the Clark Street of 1997. In the older images, we see a Clark Street gripped by urban decay. Palazzolo describes the downtrodden Clark Street of the past as “the best integrated section of the city,” given that its inhabitants were united by their shared hardship. The unfettered realism depicted in Palazzolo’s images of poverty, alcoholism and depression shows the strength of underground film’s ability to document the marginalized. Down Clark Street provides an interesting study of then-and-now and the effects of gentrification; Palazzolo cross-fades images of the flophouses and dive bars of the ‘60s into the Rock’n’Roll McDonalds and Hard Rock Café of today. As in I Married a Munchkin, Palazzolo defers any judgement to the minds of his audience. A characteristic that all three films share is an abrupt editing style, including clips that persist a few seconds after one would traditionally expect them to cut. Some viewers may be put off by this disjointed editing. One could argue Palazzolo is being reflexive by removing the veneer and taking viewers into the “making of”, but others may consider his messy in- and out-points simply lazy or ill considered. On the other hand, the lack of fine trimming seems to enhance the gritty, urban nature of Palazzolo’s films. After all, he’s not celebrating the Chicago seen in glossy postcards or from air-conditioned tour buses. This is the brawling, building, sweating, laughing, sneering, singing Chicago lauded and lamented by Carl Sandburg. As director Werner Herzog has said, “The poet cannot avert his eyes.” This DVD strongly suggests Tom Palazzolo is that kind of poet.